We are fully trained and approved installers of the unique RubberBond Fleeceback EPDM membrane and have been fitting this material since 1997. This system will give you a worry free flat roof professionally fitted and wih a life expectancy of 50 years. 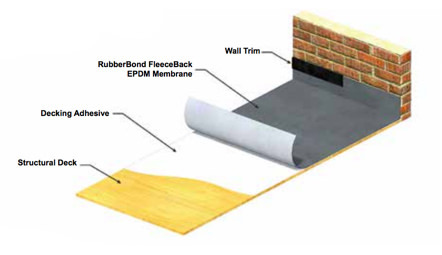 Whatever your flat roofing requirement you can be confident that a RubberBond Fleeceback installation will give you a flat roofing solutions that not only looks good, but is proven to last over 50 years. RubberBond Fleeceback EPDM is manufactured by the trusted world leaders of roofing systems, Carlisle Syntec, based in the USA. Carlisle has been leading the industry in single-ply manufacturing, research, development and innovation for more than 50 years. It’s amazing value for money when compared to the alternatives and you know you will be making a justifiable investment in a product with proven reliability. 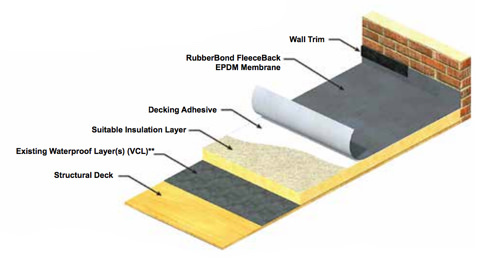 Roofing projects aren’t all the same, with RubberBond you roof doesn’t have to be just a roof. We are approved contractors to Flex ‘R’ and have been installing this material since 1996. We have completed many projects in the commercial sector and also residential care homes and M.O.D contracts. 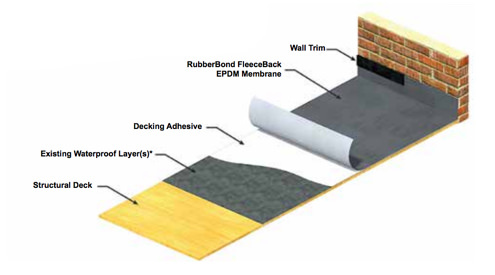 Whatever your flat roofing requirement you can be confident that a Rubberbond Fleeceback installation will give you a flat roofing solution that not only looks good, but is proven to last over 50 years. Rubberbond Fleeceback EPDM is manufactured by the trusted world leaders of roofing systems, Carlisle Syntec, based in the USA. Carlisle have been leading the industry in single-ply manufacturing, research, development and innovation for more than 50 years. It’s amazing value for money when compared to the alternatives and you know you will be making a justifiable investment in a product with proven reliability/ Roofing projects aren’t all the same. 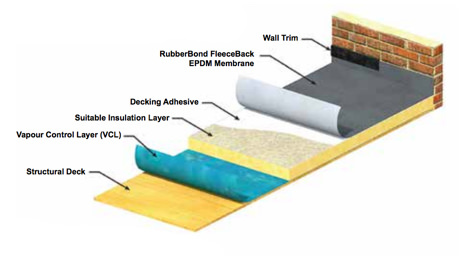 With Rubberbond your roof doesn’t have to be just a roof! The material was introduced in 1980 and has proven performance, durability and flexibility over a wide range of building types. The material has been proven to last a minimum of 35 years and delivers superior long term weather-ability. There are a wide range of accessories to compliment and incorporate into this system. A proven lightweight material that is ideal for residential flat roofs as it can often fitted in one piece, offering a seamless finish. We have also used this material on large industrial contacts. The below photos help to showcase the versatility of this material.